These matcha green tea bath bombs are such a strong addition to any homemade bath bomb collection. 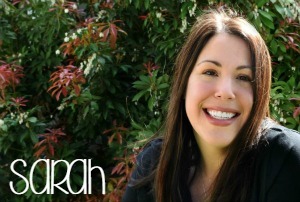 The antioxidant properties of green tea combined with the clean scent are just what you need! They also make a wonderful gift. 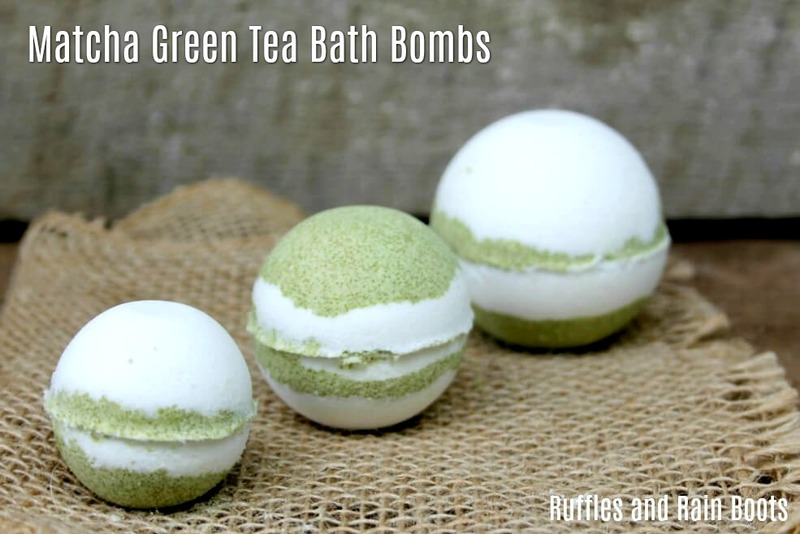 Why Add Matcha Green Tea Bath Bombs to Your Routine? 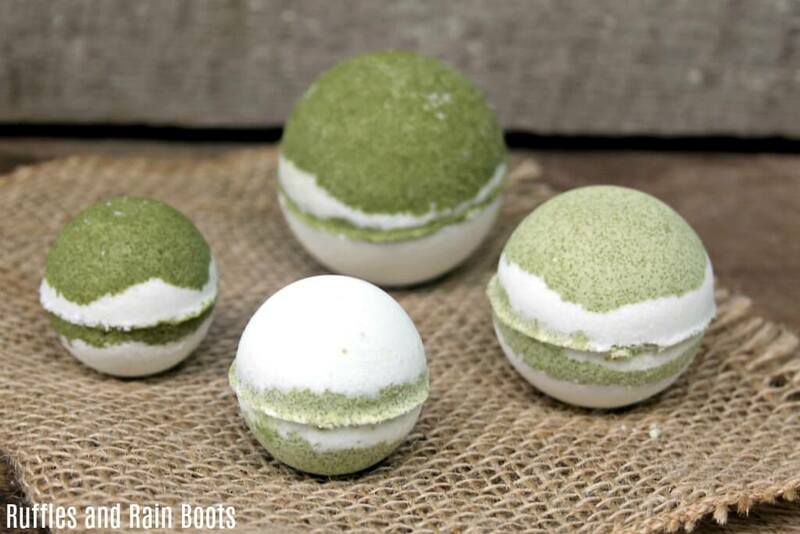 We’re no stranger to making amazing bath bomb recipes here on Ruffles and Rain Boots. And although I love green tea to drink and I use matcha powder in my smoothies, I’ve never crafted bath products with it. Matcha is pounded green tea and is known for being a powerful antioxidant. Additionally, it’s a calming, clean scent on its own which means it will blend well with your favorite scent. Do add an essential oil to this one – I made some without scent and it didn’t transfer well to the bath – I could barely smell anything. When the vanilla was added, however, it added a sweet scent to the bath. 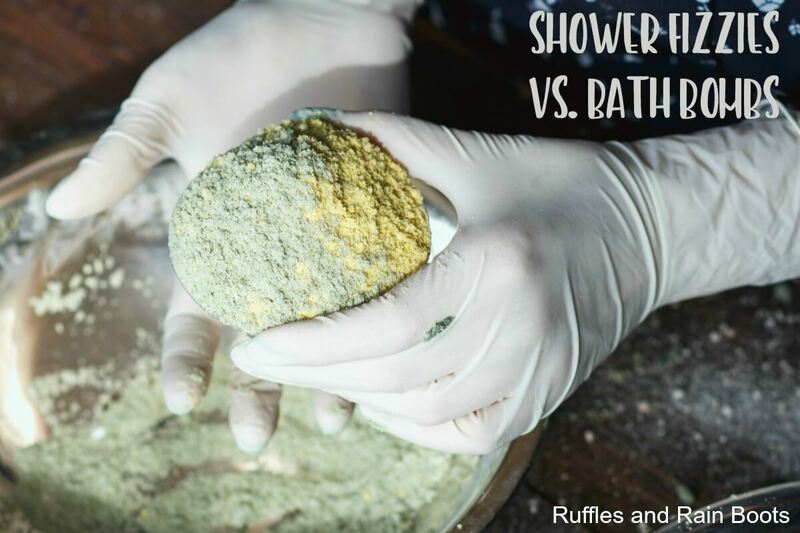 If you’d like to use this combination to make shower fizzies instead of bath bombs, please see “Shower Fizzies versus Bath Bombs” for a shower steamer recipe. The recipe shared here is not ideal for shower fizzies – you’ll waste ingredients, time, and can potentially make something dangerous. 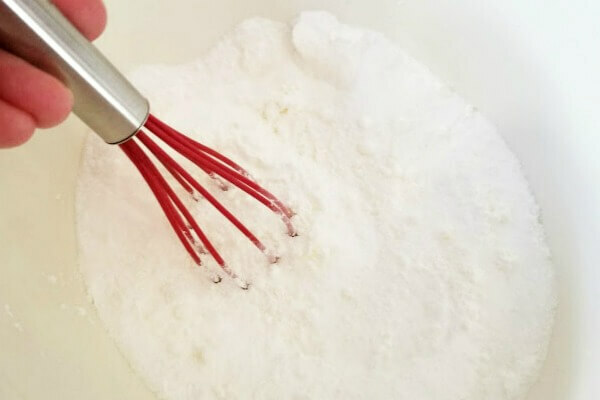 Even if you’re new to making bath bombs, this is a simple recipe which comes together easily. Mix baking soda, citric acid, cornstarch, Epsom salts, cream of tartar, and vanilla. You can run the baking soda, citric acid, and cornstarch through a mesh sieve to ensure there are no clumps. Divide your dry mix between two bowls. Add the matcha powder to one bowl, mixing well to allow the green tea to be fully incorporated. Add water (or witch hazel) 1/2 teaspoon at a time, mixing after each to incorporate fully. You’ll need no more than 2 tablespoons for most climates, but start off with MUCH less. The mix should be “wet” enough to simply stay together once squeezed in your hand. Repeat the same steps as above to set the white bath bomb mixture. 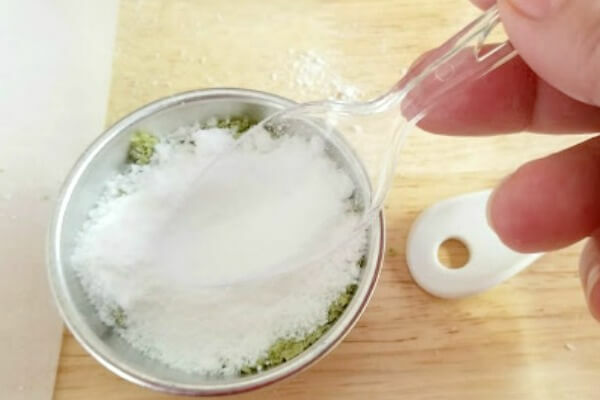 Using a spoon, add a small amount of the green mixture to one side of the bath bomb and press it down. Repeat with the white mix on the same bath bomb side (allow it to overflow and make a stack at the top). Repeat with the other side of the bath bomb (starting with white mix). Press both sides of the mold together. Although sometimes these bath bombs can be removed to dry and harden outside of the mold, you might want to make your first batch set in the molds overnight. 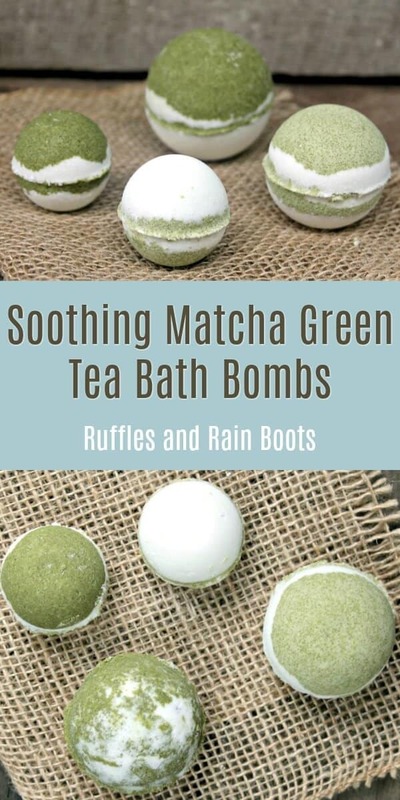 Store your gorgeous matcha green tea bath bombs in an airtight container until ready to use. We use these apothecary jars to store ours in. These matcha green tea bath bombs are such a strong addition to any homemade bath bomb collection. Add water (or witch hazel) 1/2 teaspoon at a time, mixing after each to incorporate fully. You'll need no more than 2 tablespoons for most climates, but start off with MUCH less. The mix should be "wet" enough to simply stay together once squeezed in your hand. 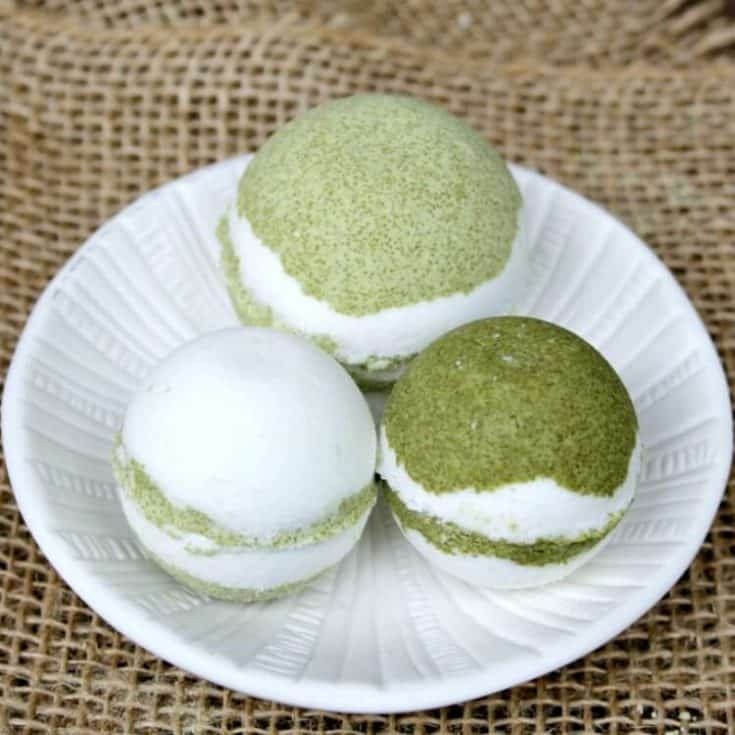 Store your gorgeous matcha green tea bath bombs in an airtight container until ready to use. We use these apothecary jarsto store ours in.